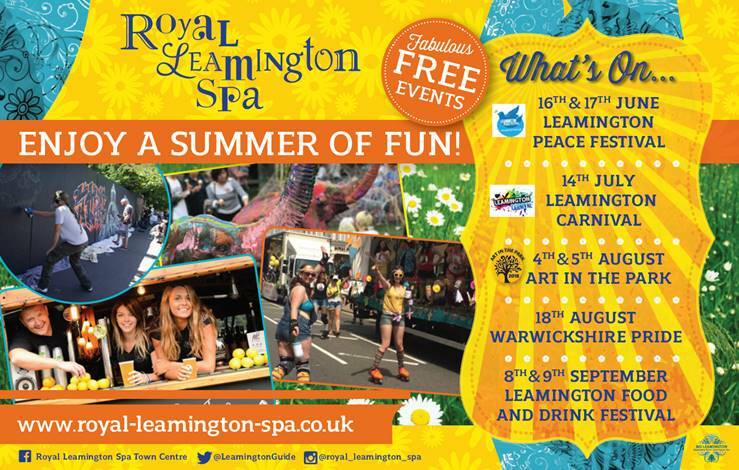 The sun shone through for the Leamington Food and Drink Festival as a fitting finale to the town’s scorching ‘Summer of Fun’. Blue skies on the closing day of the weekend showcase of food and drink, now in its 11th year, saw the Royal Pump Room Gardens bursting with foodies and flavour. The festival lived up to its reputation as one of the country’s best autumn food festivals with a spoilt-for-choice range of exhibitors dishing up tastes from near and far, from local beer, cider and wine to global cannoli, jerk chicken and churros. 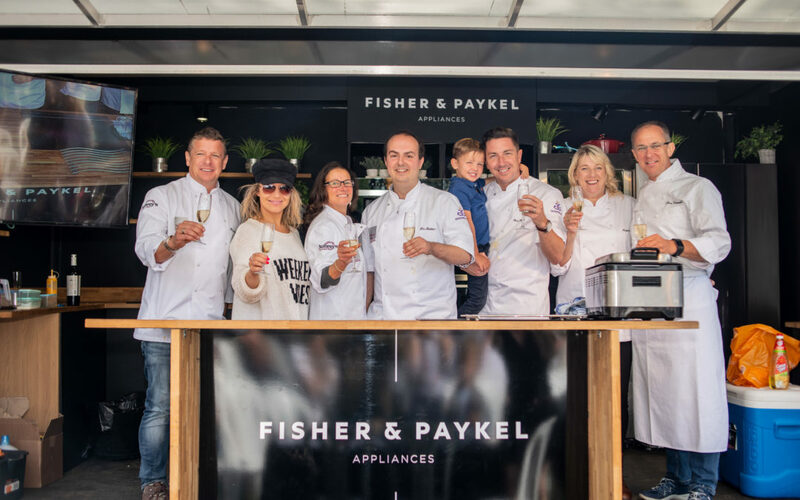 A feast of local chefs showed off their culinary skills with demonstrations in the Live Kitchen over the two days – but it was time for the best amateur cooks to shine on Sunday with the the return of Home Cook of the Year. A record number of entries to the competition, run by Aubrey Allen with festival organisers BID Leamington, made it tough to pick three finalists to go head-to-head in a three-course cook-off in front of crowds at the festival. And the decisions didn’t get any easier when Sean Hughes, Tim Robbins and Trudie Udell stepped up to the plate to wow the judging panel of Russell Allen, managing director of Aubrey Allen, Clive Fretwell, executive chef at Brasserie Blanc, and Sophie Hyam, Home Cook Winner 2017. It was Tim, a University Hospital Coventry doctor from Leamington, who was crowned this year’s champion. Alison Shaw, project manager at BID Leamington, said: “With the diversity of exhibitors this year, it really has lived up to its reputation as one of the best food festivals around. “Many of the exhibitors sold out on the first day and had to replenish their supplies overnight which is a great sign of how well it’s gone. “New for this year was us offering a free drink to anyone travelling to the festival by train and there was a great take-up which was really pleasing. 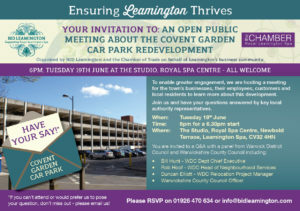 A public meeting is to be held on the high-profile redevelopment of Covent Garden Car Park in Leamington. The event will give local businesses, employees, customers and residents the chance to put forward their questions on the development of new headquarters for Warwick District Council, new multi-storey car park and apartments on the site. It is being jointly organised by BID Leamington and Leamington Chamber of Trade on behalf of the town’s business community and will take place at The Studio in the Royal Spa Centre on Tuesday, June 19, at 6pm. It is hoped that the meeting will enable greater engagement and opportunity for the wider community to have their questions answered by key local authority representatives including Bill Hunt, deputy chief executive of Warwick District Council. BID Leamington is concerned that insufficient provision has been made for the loss of parking and that the new multi-storey will not be able to meet increased demand from the new headquarters and apartments. 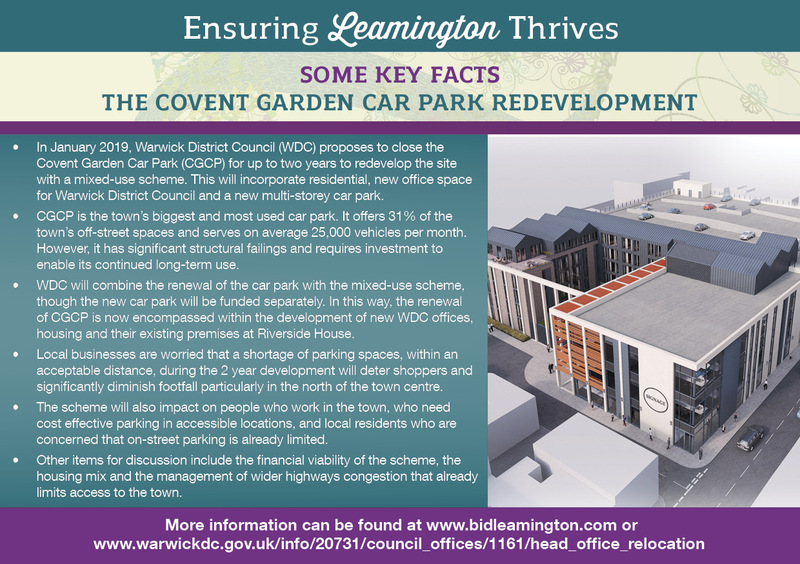 Stephanie Kerr, executive director of BID Leamington, said: “The Covent Garden Car Park redevelopment will greatly impact on local businesses, their staff and customers. 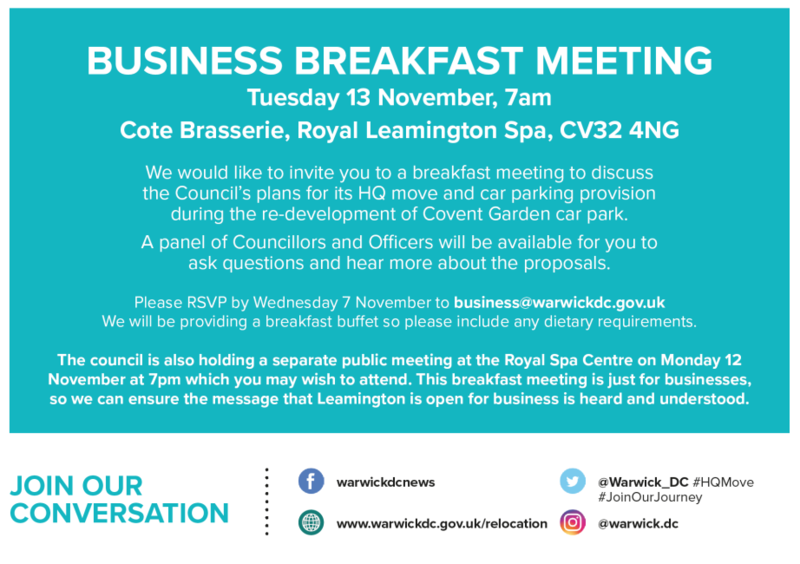 “As their collective voice, BID Leamington has been actively lobbying on the scheme for over a year, particularly in relation to the displacement plan for parking. 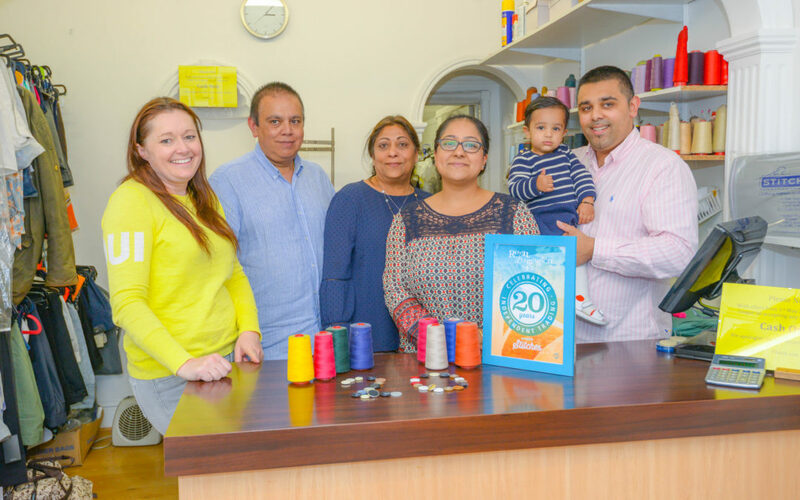 “As part of that, we met with Cllr Andrew Mobbs, leader of Warwick District Council, in early February when we set out the concerns of 200 businesses which included 27 emails that we had received from individual retailers. 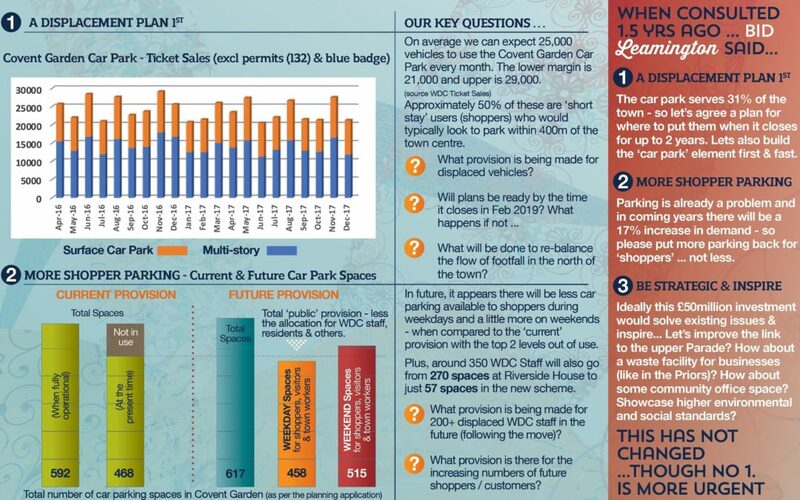 “With around 25,000 vehicles per month affected, local businesses are worried that a shortage of parking spaces, within an acceptable distance, during the two-year development will deter shoppers and significantly diminish footfall particularly in the north of the town centre where businesses will also notice the loss in passing foot traffic. “We are committed to working with Warwick District Council not only to improve parking in the long-term but to attract the right kind of investment to take the town forward. 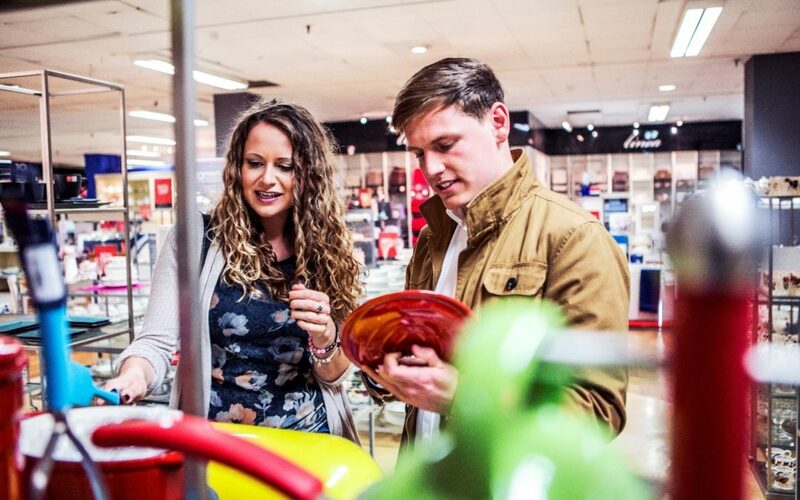 “However, we feel that this needs to be delivered in a way that responsibly mitigates any disruption to businesses as the high street is already facing significant challenges. To view the plans for the development, please visit the Warwick District Council website by clicking here. More details can also be found on the invitation by clicking on the images below. 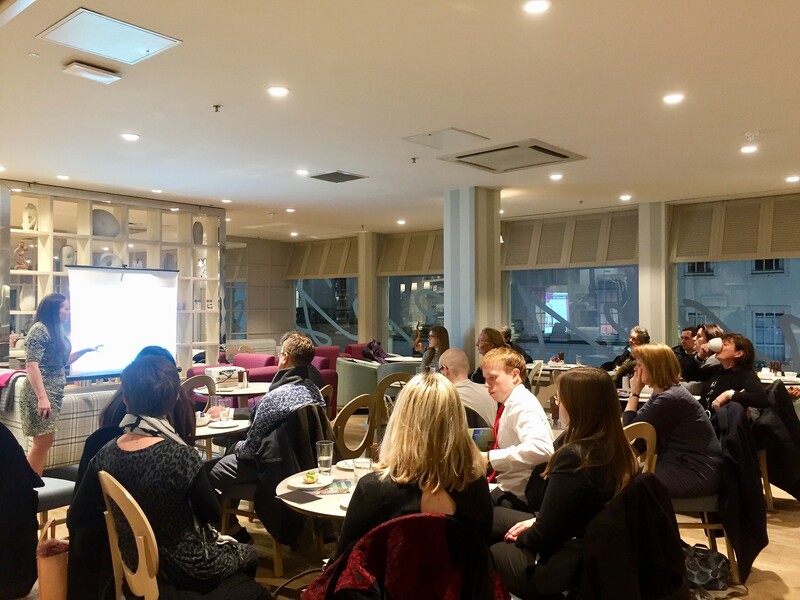 We were very pleased to welcome businesses to House of Fraser for the launch of the BID Leamington renewal proposal. 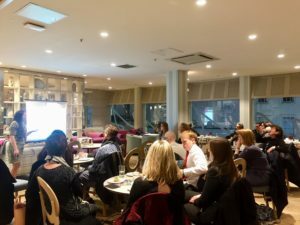 Businesses learnt about how we will ensure the town centre remains a competitive, vibrant and well-managed destination in the future. There is no doubt that given all the changes, challenges and opportunities facing the town centre, it is more important than ever that businesses have the focused delivery, representation and support that BID provides. 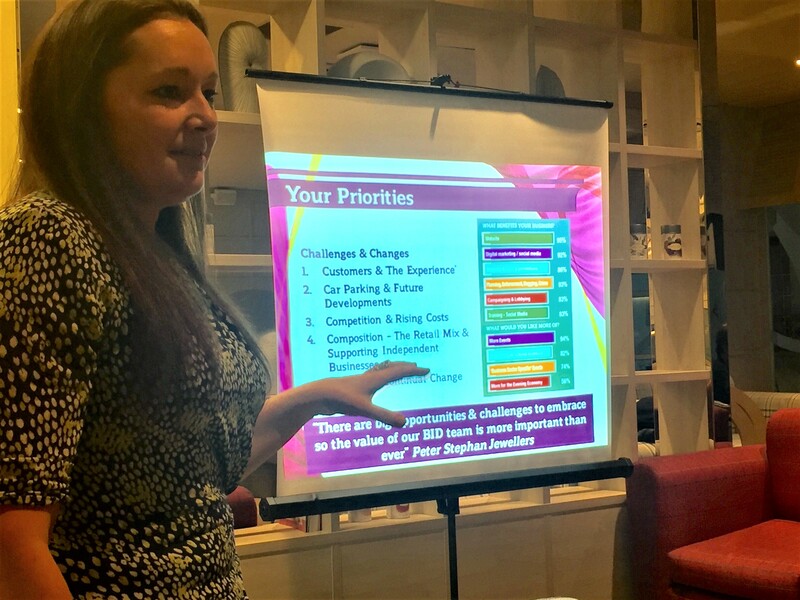 Among the topics, we discussed the way the town centre and consumer behaviour is changing and how with increased competition both online and in neighbouring towns and cities, the need to attract customers and enhance their experience is more important than ever. This may be through the delivery of events and marketing (valued at £160,000 per year) or the provision of enhancements such as maps, floral decorations and Christmas Lights and campaigning on issues such as parking and begging (valued at over £60,000 per year). We covered developments that will be going on in the town centre during the next five year BID term. 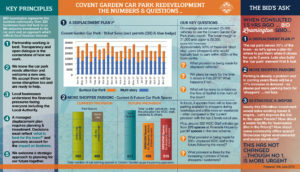 This includes the Covent Garden Car Park redevelopment (31% of spaces) and the Old Town Creative Quarter. Business representation is essential to ensure we successfully mitigate the impacts of this and create the right opportunities to improve the town. There are a number of exciting opportunities on the horizon also. This includes the Coventry City of Culture 2021 which is expected to drive millions of pounds of investment and visitors into the region and the Commonwealth Games in 2022 which Leamington is a host venue. Preparing to attract and accommodate these new visitors will take a focused effort. 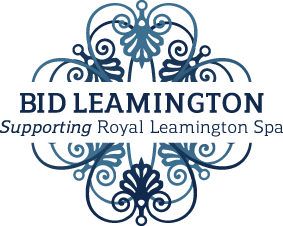 Alongside this business support will remain an important part of the BID Leamington offer. There is a huge range of things we help businesses with on a 1:1 basis from digital health, planning, rent and rates reviews, begging, overhead costs, waste management and more. We expect the need for this to increase so have planned for that in the new Business Plan. In terms of next steps, by now you should have received the ‘Notice of Ballot’ setting out the upcoming ballot arrangements and you will receive your ‘Ballot Paper’ at the beginning of March. 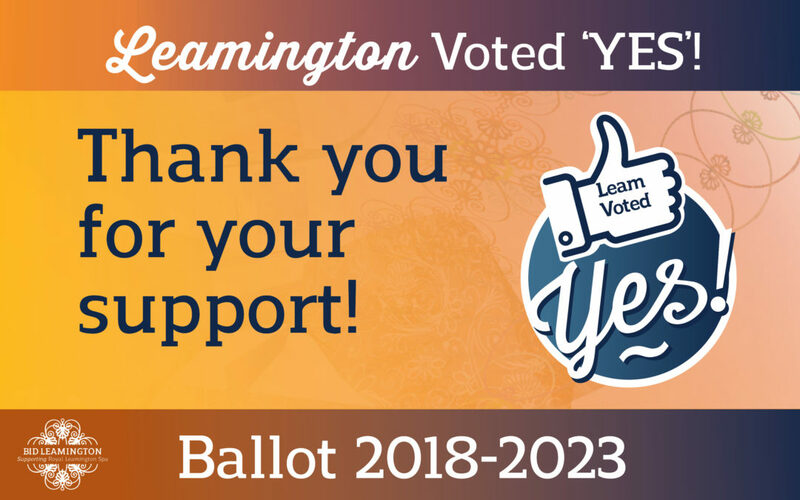 Voting ‘YES’ will ensure that BID Leamington and all its services are retained for a further five years. We know there is a lot to do, but equally there is much to lose so please do take the time to read the information that is delivered to you and do not hesitate to contact either myself or Alison if you have any questions. For more information on the ballot please click here. With the arrival of 2018 comes much change as well as new challenges and opportunities as we greet two very significant proposals that will affect the town’s future. 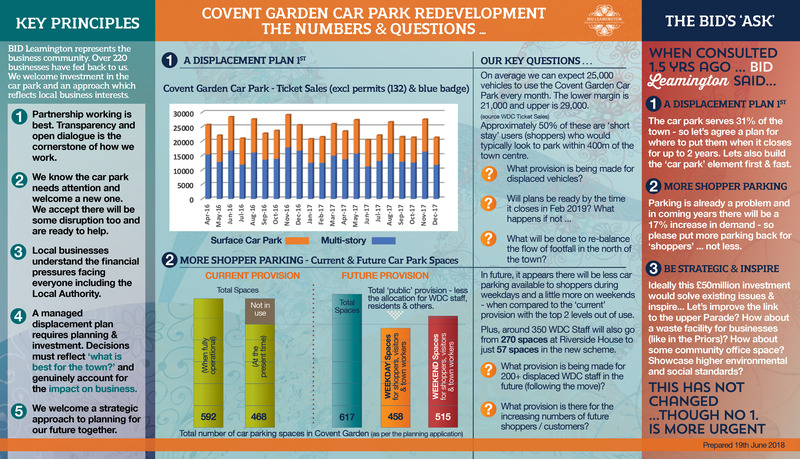 The first, is that permission has been granted to develop the Covent Garden Car Park which will have a significant impact on local shoppers and staff when development begins. 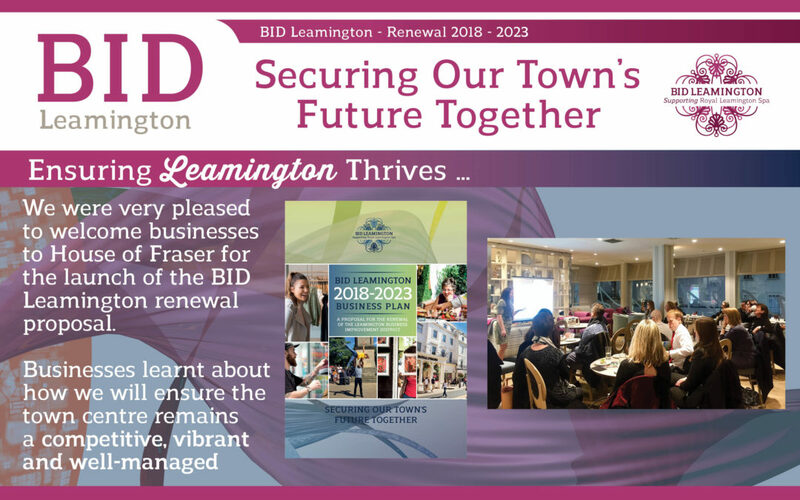 Secondly, after ten successful years of activity BID Leamington will once again be asking businesses to support it’s continuation in the 2018-2023 Renewal Ballot. This happens every five years. These two things are related because in many ways it is more important than ever that businesses have the focused delivery, representation and support that BID Leamington provides. Other developments are also on the horizon – in the Old Town plans to develop the ‘Creative Quarter’ have been announced and we will see ourselves defending the town against more out-of-town retail development. 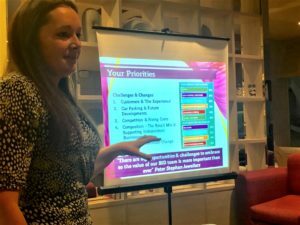 As well as this, there are many business challenges to tackle and exciting opportunities to embrace in coming years, such as the Commonwealth Games 2022 (Leamington Spa is hosting the Bowls), Coventry City of Culture 2021 and a new train-line from Kenilworth to Leamington. Based on extensive engagement in 2017 and market research, a new Business Plan 2018-2023 will be launched at our Business Meeting on the 7th February. Further ballot related documentation will arrive mid February, before the ballot papers arrive in March. Retail and leisure businesses in the BID area with an RV of £15,000 or more will have 1 month to vote. Please note, papers may be posted to head offices, so please get in touch if you have any questions about this. Please take a look at our upcoming events and activities. We have lots planned throughout February and March to drive visitors and raise awareness of your business over Valentines Day and Easter. We will also be taking bookings for future events and promotions such as the Food & Drink Festival and summer Little Book of Offers, which go ahead subject to the continuation of the BID. The BID team care for the town and its business community. We are committed to representing your interests and working in partnership to shape how the town develops. We also have lots of ways for you to benefit directly also so please get in touch to find out how you can get more involved. We very much enjoy dreaming up some ideas together as there is nothing we like more than helping businesses to get the best out of the town. We wish you an exciting and prosperous year!